For surface spray: Do not allow adults, children or pets to enter the treated area until sprays have dried. Do not apply this product in a way that will contact adults, children or pets, either directly or through drift. For space spray: Do not allow adults, children or pets to enter until vapors, mists and aerosols have dispersed, and the treated area has been thoroughly ventilated. Do not remain in treated area. Exit area immediately and remain outside the treated area until aerosols, vapors and/or mists have dispersed. Do not wet plants to point of runoff or drip. Do not wet articles to point of runoff or drip. Do not use treated article until spray has dried. Dry clean treated clothes before wearing. Not for broadcast use on indoor residential surfaces. Do not water the treated area to the point of runoff. Do not make applications during rain. Remove or cover exposed food and drinking water before application. Remove or cover dishes, utensils, food-processing equipment and food-preparation surfaces or wash them before use. Remove pets and birds, and cover fish aquariums before spraying. Vacate room after treatment and ventilate before reoccupying. Do not allow children or pets to contact treated areas until surfaces are dry. Hold can upright and spray from a distance of 12-15 inches. FLYING INSECTS: Houseflies, Fruit Flies, Mosquitoes, Wasps, Hornets, Yellowjackets, Gnats, Skipper Flies and Small Flying Moths. Spray window sills, window and door frames, and other indoor surfaces where these insects may land. Close all doors and windows, and spray upward into center of room with a slow, sweeping motion. Spray 5-10 seconds for average room, moving toward the door. 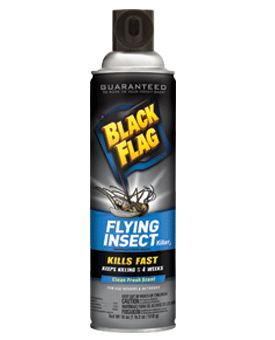 Direct spray to all parts of the room, especially windows and other light sources which attract these insects. Keep nozzle in constant motion. Leave room and keep area closed for 15 minutes after spraying. Ventilate room thoroughly before re-entry. Sweep up and discard fallen insects. Point nozzle away from face. Hold can at slight downward angle. For best results, spray when air is calm. Allow a few minutes for product to take effect. Spray with wind if breeze is blowing. FLYING INSECTS: Flies, Mosquitoes, Wasps, Hornets, Yellowjackets, Gnats and Small Flying Moths. Allow fog to drift over area. Direct spray toward bushes or grass from at least 4-6 ft away. Give special attention to breeding areas such as garbage cans and compost piles. Pesticide Storage: Store in a cool, dry area. Do not transport or store below 32°F. Pesticide Disposal and Container Handling: Do Not Puncture or Incinerate! If partly filled: Call your local solid waste agency for disposal instructions. CAUTION. Harmful if inhaled. Avoid breathing vapor or spray mist. Avoid contact with skin or clothing. Wash thoroughly with soap and water after handling and before eating, drinking, and chewing gum or using tobacco. Remove and wash contaminated clothing before reuse. If on Skin or Clothing: Take off contaminated clothing. Rinse skin immediately with plenty of water for 15-20 minutes. Call a Poison Control Center or doctor for treatment advice. Have the product container or label with you when calling a Poison Control Center or doctor, or going for treatment. This pesticide is extremely toxic to aquatic organisms, including fish and invertebrates. Do not apply directly to or near water. Drift and runoff may be hazardous to fish in water adjacent to treated areas. See Directions for Use for additional precautions and requirements. This pesticide is highly toxic to bees exposed to direct treatment on blooming crops or weeds. Do not apply this product or allow it to drift to blooming crops or weeds while bees are actively visiting the treatment area. Contents under pressure. Do not use or store near heat or open flame. Do not puncture or incinerate container. Exposure to temperatures above 130°F may cause bursting. Do not use this product in or on electrical equipment due to the possibility of shock hazard. NOTICE: To the extent consistent with applicable law, buyer assumes all responsibility for safety and use not in accordance with directions.